※PORTABLE&LIGHT WEIGHT : The car vacuum comes with lightweight design for a quicker, effortless clean. Low noise 4500pa provides an efficient quiet clean .Cordless & portable handheld vacuum designed to make your life easier, the auto vacuum is powerful enough for all of your basic, slight cleaning tasks, including cleaning light dust or rubbish on the surface desk ,limited floor area ,bed ,computer keyboards and can be used to clean every corner of your house & car. 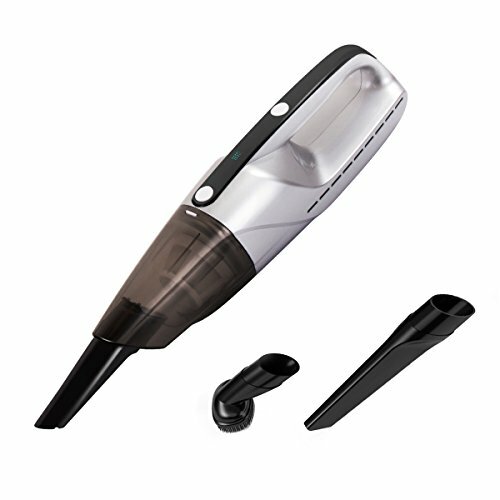 ※3-in-1 VERSATILITY: Handheld Vacuum Cleaner comes with 2 pcs Suction Nozzles with different length + 1 pcs Brush Suction Nozzle. The different purposeful nozzle tool will get into those tight, hard to clean areas with ease. It attaches to the nozzle and allows you to get deep into corners and tight spaces. Dusting brush for easily picking up hair or dirt on delicate surfaces & upholstery. ※RECHARGEABLE : The mini vacuum cleaner has a built-in 7.2V recycled and rechargeable battery power enables you to clean for 20 minutes within no-fade running time of optimal cleaning after 2.5 hours fully charging,charged by USB cable.The car vacuum cleaner is very convenient and practical which allows you to clean your entire house without re-charging & a tangled cord. Nothing else at this price has that combination of versatility and cleaning strength.